The thing I really like about Trajan despite its very apparent lack of any theme is that the mancala is so excitingly puzzle-y. There's so much you want to do but get constantly restricted based on what can and cannot fall into a certain bowl and how you must fine tune your plan so that each action you take sets up the next action and again and again. Poor planning will see you spending a few turns reorganizing your markers and wasting away precious actions and time. I've never played Trajan 2 player before, and I will say that it actually does play very well in that number count. The game is VERY fast because the time track is so much shorter now. We finished up our game in barely 45mins. Great fun in a short span of time. What more could you ask for? Trajan doesn't feel like the point salad that Castles of Burgundy is. Sure, there are multiple actions that give you immediate points (military, trajan tiles, senate, shipping). 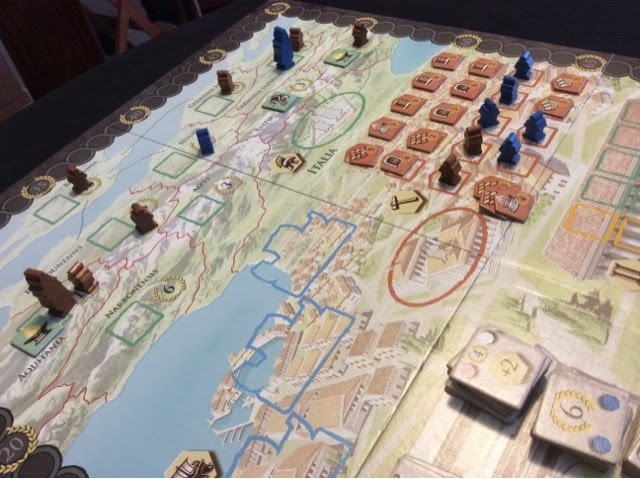 But a lot of the points in Trajan have to be worked on to achieve maximum results. Shipping requires sets of similar cards to optimize your scoring opportunities. The construction action must be done in sets to get a good end game bonus. Military comes at a huge cost of constantly having to place legionnaires on the board before they can be moved to provinces for points. If you don't have a plan, you will not score a lot of points. So its really unlike Castles where everything you do nets you points - it just depends how many you actually get and can combo off. I had went in thinking about trying a military strategy, but since my friend went first, that was exactly what he decided to do. So, more change of plans for the day. I settled for the construction and shipping actions instead. The shipping action has always been a fun one to try for me, I just love drawing the cards and finding its something I want. Well, it doesn't always turn out that way but its just a small gambling part of the game that I like to mess around with to satisfy my urge to push my luck. Hehe. My friend successfully "conquered" majority of the provinces and really pushed me right to the brink (I had actually thought I would crush him easily :P). He combined the senate and military very well and nearly pulled out a come from behind victory on me. I ended up with a 3 point win but was really surprised how close it was. By end game I had managed to ship 4 of the same cards twice, and I think that made all the difference. Great fun and I think I should make a conscious effort to take it out more often. 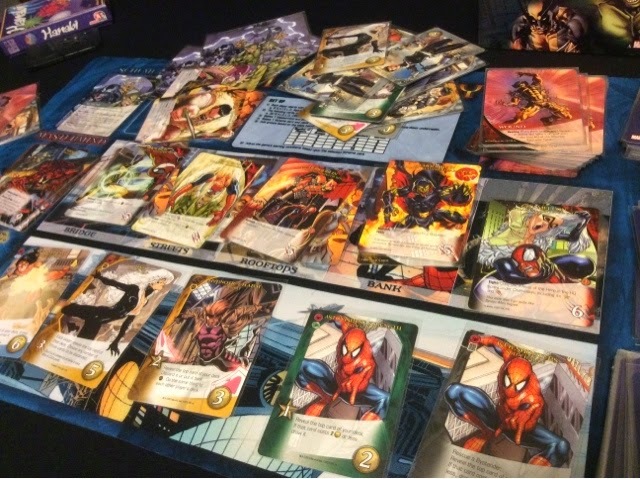 We ended the day with back to back games of Legendary: Marvel deck building game. I recently acquired the Paint the Town Red expansion and was very eager to give it a go. Our first game was against Apocalypse, and that went terribly. I know the game is much easier with lesser players compared to more and that was one of my gripes with the game. But even with it being "easier", Apocalypse totally creamed us - unfairly. You see, he has a tactic card that says "if this is not the last tactic card, reshuffle it into the deck". So in theory, Apocalypse can be unbeatable / players can be stuck in an infinite loop. There are 4 tactic cards in a mastermind's deck, and so in theory you only have to defeat a mastermind 4 times to win. We did defeat him 4 times, but 3 of the 4 times we drew that dreaded infinite loop card. What a freaking mess. I think that card is somewhat broken, or at least spoils the nature of the game. Even if there were 2 cards left in the mastermind deck, that's a 50% chance to draw that card ! Horrendous odds ! Well, we got crushed and we weren't too happy about it. Terrible run of bad luck. Spiderman why you no wall crawl? All your friends have wall crawl! Next up was Carnage ! Great ! Finally get to try the new expansion. We purposely added a few of the new expansion characters as well - Black Cat, Spiderwoman, Moon Knight. The new wall crawl ability is fantastic. No more waiting for your cards to get shuffled back, instant gratification and satisfaction. I really like what the wall crawl mechanic brought to the game. As for the feast mechanic, it was not bad. It basically makes you discard the top card from your deck. So it really does harm you if it was a good card, but most of the time it happened it was usually a starting hero or low cost character which was not too heartbreaking. The feast mechanic is fun to have, but I didn't think it was very challenging nor did it strike fear into our hearts. But I can imagine the pain in a 5 player game when you lose a character and have to wait 4 turns to buy someone new. That would totally stink. We (more like my friend) destroyed Carnage. He was too easy for a 2 player game. Considering we had the scheme about spider DNA, that meant that all the villains were more powerful than Carnage himself. The scheme gave the Sinister Six a +3 attack strength. So that made most of them more dangerous than Carnage, erm, ok? That is just strange. Well, I still love Legendary quite a bit, but I find the varying difficulty due to player count a slight turn off, and the huge discrepancy in mastermind strength a major turnoff. I no longer feel like I want to battle Red Skull or Magneto. But I also feel like I don't want to waste time on Apocalypse or Galactus with multiple players. So I'm kinda torn. If only it balanced much better, that would make me more excited for the game. Right now, I don't know what to expect each time I take out the game - easy or very hard? - except the tedious setup and take down, that is the only guarantee. I have the Paint the Town Red expansion as well, but have yet to try it. Without thinking too hard about it, that Apocalypse card does sound "broken". Perhaps a limit of being drawn three times in a game is needed?